This is without a doubt a multi-billion dollar question. Aside from all of the moronic dieting approaches, (cleanses, single food diets, eat only between 4 and 8 pm and so forth), there are really only two schools of thought that have any merit; low carb and low fat. Everyone (but Oprah and Dr. OZ) knows, that in order to lose weight, you must create a calorie deficit, and so cutting out energetic macros makes the most sense. Cutting protein would also work, but would lead to a tremendous loss of muscle = negative gains. 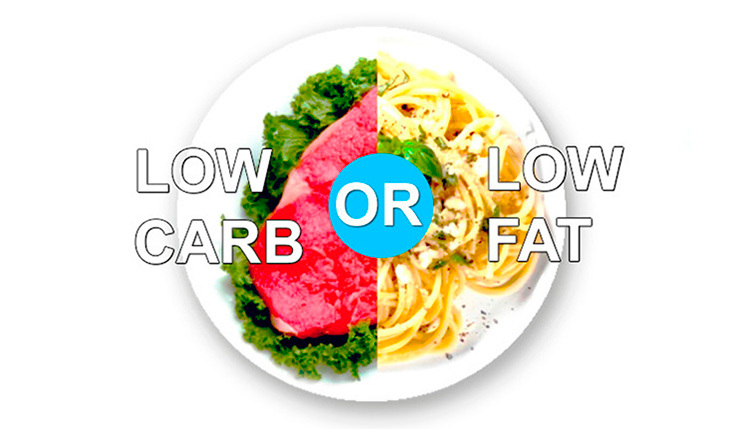 So, low carb or low fat? Just to quote Captain Obvious – they both work. Hunger seems to be reduced since protein works as a hunger deterrent. It is easy to follow, even when eating out. On the downside, the lack of insulin can lead to diminished performance in the gym and give the muscles a mushy look. Therefore, I would recommend a carb up every so often. Carbohydrates are helpful to keep the thyroid happy and keep the muscles full. Eating low fat does require a bit more work since carbs are easy to overeat. Foods can be bland since fat carries taste. I feel that a low carb diet is a great lifestyle to follow, and it helps to keep a decent body fat level. However, and this is just my from my own personal experience, I have always had my best results with a low fat diet, when trying to get those last two or three lbs off. Then again, everyone is different, and trial and error is the best way to find what works for you! Next post: Bulletproof Coffee – The Breakfast of Champions?